A blend of fiction and fact, enhanced by photographs, The Stopover takes its readers on a voyage to uncharted territories through four absorbing stories. I have been lucky enough to have received few pages of this book sometime back for a review. That review made me ear-mark this book as a to-be read as I was really looking forward to its release. As I had mentioned that I will be back with a full review on release, so here it is. Some of the most obvious things in life are sometimes the most forgotten. We need reminders from life to realise their importance and beauty. 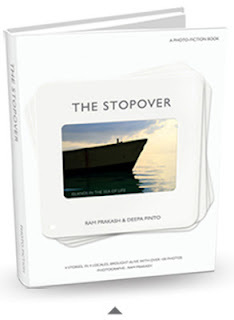 "The Stopover" by Ram and Deepa is one such reminder - to look at some of the most beautiful yet oft-neglected things like love, relationships, family and society in a new light. Many times you read a book with description so vivid that you are transformed into another world altogether. Now add exquisite photographs to such a narration and what do you get - a wonderful experience which you cherish for a life time! This book not only weaves magic though its words but captures your imagination with its lively pictures as you live each story with every word and every picture. The most common thing in all the four stories was one message that stood out -Listen to your heart. This simple thing is sometimes the only which we don't do in life ending up it in chaos. It is very difficult to pick one out of them as my favourite as all of them are distinct and brilliantly narrated. The stories was a beautiful reminder that there are things above all the materialistic things we give so much importance to. We are chasing a mirage and forgetting the reality existing around us. I loved the simplicity which surrounded each of the characters as it made them more realisitic. You could feel it was your tale which could be happening to you sometime. The index has also been very innovatively done as the itinerary for your voyage. The name - The Stopover - Islands in the sea of life actually suits this book very aptly. As after reading every story and moving on to the next you feel you were on one island where you experienced something magical and now it is time to go to another island to experience something new. It was a very heartening read . I always believe we are born with the right to existence. And no one has the right to take it away from us. Seeing a fellow human being do this to another is extremely cruel for me. As there is no other word I can find which can describe it so well. Though I am born and brought up in a city different from my forefathers I still have a lot of attachment solely because I know my roots lie there. I cannot imagine a situation where I will be treated as an outsider there or here, the city where I have grown up all these years. I salute the strength of all those Tibetans who have been living like this for so many years with nothing but hope in their hearts and smile on their lips. With the onset of winter, I will soon have Tibetan markets coming up here and I assure you, after reading this story I will never ever be able to look at them without a cringe in my heart as it will remind me of this story. I wonder how many hidden tales of this type they all would be carrying behind their ever-smiling face!! In our growing up years we tend to go through a phase where we misunderstand our parents and take them for granted. The generation gap as it is called seems to widen with each passing day making the communication more and more difficult. This story is about a father and a son, about life comes a full circle as what goes away comes back to you at the right time. The power of self -less love and care which our parents have for us is very well brought out in this story. As mentioned earlier I have grown up in a completely different city from my ancestors, and I feel very strongly for both the places. I have made a conscious attempt to know both the cultures as I feel it is a lineage I am supposed to pass onto the next generation. We seldom realise in life the unseen responsibilities we carry which involves our culture and tradition. It is about these responsibilities that The sun shines forever talks about. Like it is said, Everything is fair ~ in love and war! We, in today's time, are fiercely independent and protective about our own identity. We would not want to inherit anything and steer clear of being typecast into what our parents have been. We want to create our own identity. While this all looks very encouraging as a thought, but in the long run we forget we don't have something our elders have - experience. It might not the the experience at being successful, it is the experience of being wrong. In this story the author has explored this facet of today's youth where we are in a dilemma to follow our heart or chase our own dreams. Though a difficult choice, it does promise to be worthwhile at the end of it all! 4 stories - each of them truly mesmerizing. It is very difficult to make a choice and pick one favourite as for me all of them are masterpieces who come together to form another one - this book. A beautiful narration teamed up with brilliant pictures makes it a wonderful and enjoyable read - something that I would want to pick up each time I need to refresh my mind. As this one promises me a voyage everytime I flip through its pages! It is a must read for everyone as it a wake up call for each one of us who are busy running behind mirages in their life. 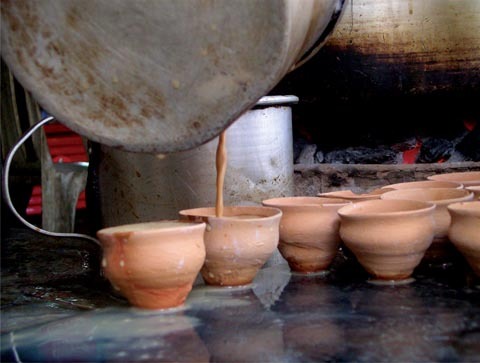 This book is like a kullad chai - Rustic, tasty, refreshing - takes you back to your roots and makes you feel what you have been missing till NOW! !